Max Cashback that can be availed is Rs 150 by new users while Rs 75 by repeat users on minimum purchase of two tickets. 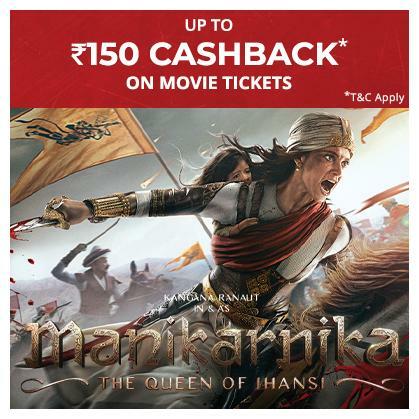 * The promocode received post purchase of this deal is only applicable for booking Manikarnika movie tickets on Paytm.com and Paytm App. * The promocode will be applicable on booking Manikarnika Movie Tickets only . * New movie user will get flat Rs 150 cashback while Repeat Movie user will get flat Rs 75 cashback on minimum 2 booking of Manikarnica movie tickets and minimum transaction of Rs 300.